Written on September 6, 2016 . Posted in Announcements + Updates, Fine Arts. Andrew Raftery (Professor, Printmaking) will open his new exhibition entitled Autobiography of a Garden on Twelve Engraved Plates at the Ryan Lee Gallery (515 West 26th Street) in New York City. The exhibition opens on 10th September with a reception from 4:00-6:00PM, the exhibition will be on show through 5th November 2016. The title, which is partly in tribute to Gertrude Stein’s The Autobiography of Alice B. Toklas, addresses the notion that this project details the full life of the garden, including its inception, development, decline, and dormancy. The twelve-month narrative, satirical in nature inherent in Raftery’s practice, plays to the absurdity of everyday life and the action of an “unrepentant aesthete” tending an ornamental flower garden. The garden is carefully conceived with annual plants, so each year the garden has different compositions and textures that evolve throughout the season. 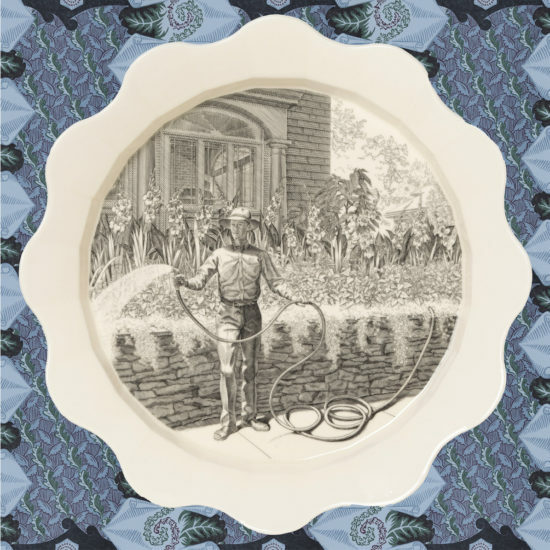 In thinking about his garden as art, Raftery translates the performance of gardening as a pictorial narrative through engraving on ceramics.